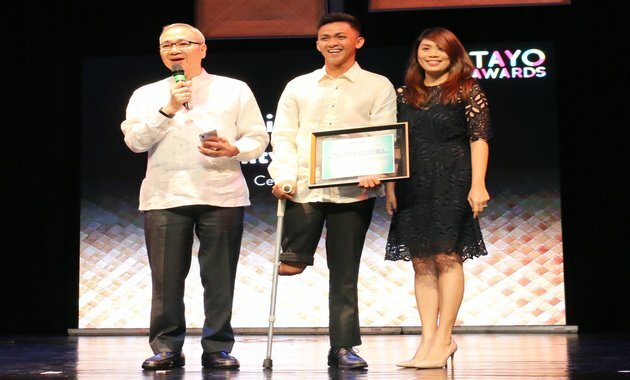 For its efforts to enable persons with disability (PWDs) to develop as independent, integrated and empowered citizens, the Philippine Accessible Disability Services (PADS) received an award from PLDT wireless unit Smart Communications. PADS athlete and youth sports mentor Brylle Samgel Arombo received the Smart Communities Award from PLDT-Smart public affairs head Ramon R. Isberto and senior manager Stephanie Orlino during the 16th TAYO (Ten Accomplished Youth Organizations) Awards ceremony held recently at GSIS Theater in Pasay City. Based in Lapu-Lapu City, Cebu, PADS was named one of the 10 TAYO Awards finalists for its Paddle for All program, which employs adaptive dragon boat racing, a seated sport, to enable the blind, deaf, amputees, and wheelchair users to engage in sports. The Smart Communities Award is given to the organization that embodies the advocacies of Smart. The company’s corporate social responsibility program is built on partnerships with various stakeholders to promote disaster preparedness, education, health, and livelihood for all. It also utilizes communications technologies to help connect communities, promoting inclusion especially for underserved sectors. “The winning organization displays the same drive to work with the community and the government toward a common goal. For PADS, it’s to uplift the quality of lives of persons with disability,” said PLDT-Smart public affairs head Ramon R. Isberto. Arombo’s right leg was amputated below the knee following a vehicular accident in 2016. It was the lowest point of his life—he felt ashamed, didn’t want to eat and go out, and tried to commit suicide several times. He soon discovered PADS and joined its adaptive sports program. Today, at 21, he is one of the group’s youngest athletes and sports trainers, teaching dragon boat racing to out-of-school youth and PWDs like him. He said PWDs are one of the sectors that benefit the most from mobile technology. “Through our mobile phones, we can easily talk to our families, friends, and teammates, for example, to coordinate schedules for training,” Arombo said. “Texting and chatting are especially helpful to our deaf members, who can use their phones to communicate aside from sign language,” he said, adding that their blind teammates also use the voice-activated services on their phones. Smart Communications is a longtime supporter of the TAYO Awards, which recognizes the outstanding contributions of Filipino youth organizations to the country’s development. The centre raises the school's capacity by 50%, helping it meet the growing demand for management and leadership education in Asia..
A reason for HR leaders to pay more attention to rewards strategies, as 63% of employees also worry about increasing healthcare co..